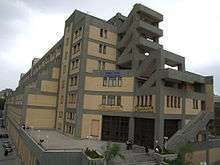 Amirkabir University of Technology (AUT) (Persian: دانشگاه صنعتی امیرکبیر Dāneshgāh-e San'ati-ye Amirkabir), formerly called the Tehran Polytechnic, is a public research university located in Tehran, Iran. AUT was the first established technical university in Iran, referred to as "Mother of Engineering Universities". Acceptance to the university is competitive and entrance to undergraduate and graduate programs requires scoring among the top 1% of students in the Nationwide University Entrance Exams, known as "کنکور سراسری". The university was founded by Habib Nafisi in 1956 and developed by Dr. Mohammad Ali Mojtahedi, during the reign of the Pahlavi dynasty. Named the Tehran Polytechnic, it began with five engineering departments. 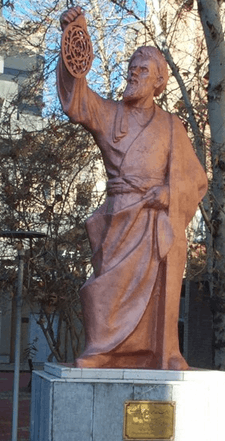 Six months before the victory of 1979 Iranian Revolution, Tehran Polytechnic was renamed after the Iranian prime minister Amir Kabir (1807–1852). The university now has 15 science and engineering departments, and two other affiliated centers, located in Bandar Abbas and Mahshahr. There are around 9,100 students enrolled in the undergraduate and graduate programs. AUT has 480 full-time academic faculty members and 550 administrative employees, giving AUT the highest staff-to-student ratio among the country's universities. The executive branch consists of four departments which receive participation from councils in planning and administering affairs. AUT has signed agreements with international universities for research and educational collaboration. There is a joint program between AUT and the University of Birmingham. AUT is one of the leading universities in E-Learning systems in Iran which has begun its activities in 2004. The university is the pioneer of sustainable development in Iran and established the AUT's Office of Sustainability on July 2011. The activities of the Office of Sustainability contribute to the AUT campus by reducing energy consumption, costs, and emissions, and also student coursework, volunteer opportunities for students, as well as research and education academic activities on sustainable development. The establishment and formation of Amirkabir University of Technology dates back to October 1956 by Eng. Habib Nafisi (حبیب نفیسی). The core of the university was, then, formed under the name Tehran Polytechnic in order to expand the activities of two technical institutes of those times: Civil Engineering Institute and the Higher Art Center. After Eng. Habib Nafisi, the founder of Tehran polytechnic, Dr. Abedi became the president of the university for a few months until Dr. Mohammad Ali Mojtahedi, the principal at the renowned Alborz Highschool, was appointed president of AUT early in 1963. Among the accomplishments of Dr. Mojtahedi are construction of a central amphitheater, a dining area and a sports ground as well as completing faculties. The university has grown to a school of science and engineering education with the capacity of about 10,000 students in 35 undergraduate majors, around 90 M.Sc. majors and 36 Ph.D. and post-doc programs. Amirkabir University of Technology has consistently been ranked as one of Iran's top universities. The 2011 QS World University Rankings ranked the university 301-350 in Engineering and Technology in the world. Iran's Ministry of Science, Research and Technology ranked AUT among the Top 3 high ranked universities in the country. In Webometrics Ranking of World Universities (2012), the university also ranks among the Top 3 high ranked universities in Iran. Computer Science and Polymer Engineering have the highest field rankings in Amirkabir University of Technology. In 2013 Shanghai ranking Amirkabir University Computer Science ranked 100-150 among World Universities. In 2014, the Shanghai ranking ranked Amirkabir University Engineering Sciences among 151-200 among World Universities . The Polymer Engineering Department of Amirkabir University of Technology is the first and most prestigious Polymer Engineering program in Iran. AUT also ranked first among Iranian universities in 2014 in the CWTS Leiden Ranking. In 2014, the US News & World Report ranked Amirkabir University of Technology Engineering Sciences 89 among world universities. Also, Computer Science of AUT ranked 90 among World Universities. 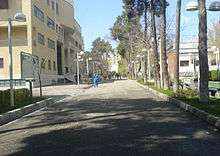 The main campus of Amirkabir University of Technology is in Tehran, Iran. It is located close to Vali Asr Crossroads, the intersection of Enghelab Street and Vali Asr Street, in the very center of Tehran City. Many students commute to AUT via the subway by Vali Asr station. The Mahshar campus of AUT has been constructed in the province of Khouzestan in 2001 in order to establish close cooperation with the national company of petroleum industries. The Bandar Abbas campus of AUT has been established in the province of Hormozgan, which is the center of marine industries in Iran. The Garmsaar campus of AUT has been inaugurated in 2011. The library and document center at AUT, the largest technical and engineering library in Iran's capital, is one of the richest academic libraries in the technical and engineering field in the region. The library includes a central library and 16 satellite libraries in Tehran and Bandar Abbas. The library has 5 million books, mostly about computing. AUT has 16 departments including 'management, science and technology', electrical engineering, biomedical engineering, polymer engineering, mathematics and computer science, chemical engineering, industrial engineering, civil and environmental engineering, physics and energy engineering, computer and information technology, mechanical engineering, mining and metallurgical engineering, textile engineering, petroleum engineering, ship engineering, and aerospace engineering. AUT has an educational site in Bandar Abbas as well as an academic unit in Mahshahr. Scientific associations exist to help students transform themselves into contributing members of the professional community. Course work develops only one range of skills. Other skills needed to flourish professionally include effective communication and personal interactions, leadership experience, establishing a personal network of contacts, presenting scholarly work in professional meetings and journals, and outreach services to the campus and local communities. The university is known as a pioneer in research and innovation in Iran. AUT is a public university and its research funding is partly provided by the government of Iran. AUT has cooperation with industrial companies specially in oil and gas industries. As a result, many research projects in the university are funded by industrial companies. Amirkabir University of Technology was appointed as a Center of Excellence by Iran's Ministry of Science and Technology in the fields of Biomechanics, Power Systems, Radiocommunication systems (RACE) and Thermo elasticity. The supercomputer of Amirkabir University of Technology (AUT) has a power of 34,000 billion operations per second. Ph.D. students and researchers of AUT use it for analysis of huge volume of data in their research studies. Amirkabir Journal of Science and Technology is a scientific journal which publishes research achievements of academic and industrial researchers in all engineering and science areas. Research and Technology Center of AUT is an office which collaborates with industries and universities in order to improve research level in the University. Ahmad Reza Tabrizi, co-founder of the Iran Canada Business Council, president and CEO of Taim Consulting Inc. and Taim Canada Inc.
Fars News Agency reports: "President of Iran's Amirkabir University of Technology Alireza Rahaei announced the country is preparing to put a new home-made satellite, called Nahid (Venus), into orbit in the next three months". Cientifica reports in news item on Nanowerk, April 25,2012: Iranian scientists are using lecithin to synthesize and bind silver nanoparticles more tightly to wool. ↑ "Financial information". Fars News. ↑ "Amirkabir University of Technology". Retrieved 18 May 2016. ↑ "دانشگاه صنعتی امیرکبیر". Retrieved 18 May 2016. ↑ "EmeraldInsight". Retrieved 18 May 2016. ↑ "Amirkabir University of Technology". Top Universities. Retrieved 18 May 2016. 1 2 "Amirkabir University of Technology - Academic Ranking of World Universities - 2015 - Shanghai Ranking - 2015". Retrieved 18 May 2016. ↑ Centre for Science and Technology Studies (CWTS). "CWTS Leiden Ranking 2016". CWTS Leiden Ranking 2016. Retrieved 18 May 2016. ↑ "Top World Universities - US News Best Global Universities - US News". US News & World Report. Retrieved 18 May 2016. Wikimedia Commons has media related to Amirkabir University of Technology.